By Mark Shaneyfelt and Christian Smith, Aurora Specialty Textiles Group, Inc. This has generated a new world of opportunity for local and regional print shops. It also presents learning curves and challenges as printers make the transition to textile media, and as they incorporate a new generation of printers and inks specifically designed to perform in this arena. It's important that printers move in this direction, the transition to textile media is not slowing down. To keep up with the demand for soft signage, today's print shop owners and managers need to understand where the new opportunities exist in the market. They also need to know how to successfully use the printers, ink and textile substrates that are taking over in support of this trend. Printers who don't keep pace with these changes may find their businesses eroding as more and more customers ask for soft signage. The trend toward textile-based printing is gaining momentum. Based on projected market data, demand for soft signage and other fabric-based printing applications is one of the strongest growth segments in the printing industry. We are currently seeing 30-percent annual year-after-year growth with textile printers. An estimated one billion square meters of textiles will be printed in 2015, with 30-percent annual growth forecast through 2019. A projected 75 percent of the growth in digitally printed textiles is in soft signage for point-of-purchase (POP), retail location interiors and trade show banners. The market is not only expanding, but also evolving in a number of different directions as designers and marketers develop new ways to use soft signage. Soft signage end products are becoming increasingly sophisticated, as well. Staying in step with the changing market demand, and a vast new array of printers, inks, substrates and design requirements, can seem overwhelming. On the contrary, it's very manageable, but requires working with industry partners who are following (and on top of) the application trends. They should be developing new products and technologies that keep pace with the demand, as well as help you select the correct printers, inks and fabrics. Additionally, it helps to work with companies that are investing in soft signage research and development. These companies are in a position to help you develop fabrics, coatings and finishes specifically designed to work with the new inks, printers and design requirements. There are many reasons why the soft signage sector of the printing industry is exploding. Generally speaking, digitally printed textiles typically produce richer, more luxurious, eye-catching visual solutions than paper, plastic or vinyl substrates. At the same time, textiles are not as subject to curling and discoloration as the paper and vinyl counterparts. Textiles can create a more sophisticated look, and this is particularly appealing to image-conscious retailers in the premium brand category. With the continued growth of online shopping, retailers are investing more and more in creating what they hope will be an unforgettable experience for shoppers when they visit a retail establishment. Retailers want to keep them coming back, and soft signage can provide a medium for artistically creative and beautiful visual graphics designed to reinforce brand loyalty. One of the appeals of soft signage is the natural drape of the fabric, which has been used for centuries in design and interiors. Fabric has an overall softer look and feel, and it can be effortlessly draped around curves. Rigid materials do not offer this flexibility, and they can also be difficult to handle and ship. Digitally printed soft signage is very lightweight and costs less to ship, plus can be folded or rolled without being damaged. For example, if you are a retailer with 30 store locations, you can easily pack soft signage in a tube or fold it up and place it in a flat box to ship quickly and inexpensively. OEM equipment manufacturers are now including textile capabilities in their equipment design, and we have begun seeing soft signage printed across the entire spectrum of ink technologies with excellent results. This includes dye sublimation (direct and transfer), solvent/eco-solvent, latex and UV. As a result, fabric substrates are part of most of the PSP (print service provider) media solutions offered to customers. With such brisk demand, the technologies, substrates and substrate coatings designed to work with the new printers have become increasingly reliable. Digitally printable textile manufacturers are even providing better ink-receptive top coatings. Meanwhile, soft signage is being used more and more in the trade show exhibit segment. Attractively printed tension fabric displays offer an outstanding value for trade show participants because they are lightweight and easy to assemble, install, set up and store. In this market, fabrics have the ability to stretch and conform to a wide variety of designs, while demonstrating dynamic lines and angles without creases, wrinkles or a distortion of the printed message. It's important to note that soft signage materials are also finding their way into other short-term events, including festivals and temporary retail promotions. Fabric LED backlit displays are also increasing in popularity, with near translucent fabrics allowing for eye-catching advertisements and brand signs designed to generate awareness. Backlit soft signage can be very dramatic or used to create a soft lighting effect. Either way, soft signage offers the potential for attractive "staging" of trade show booths, retail stores and other environments. This can be difficult or even impossible to achieve with the traditional, rigid material alternatives. 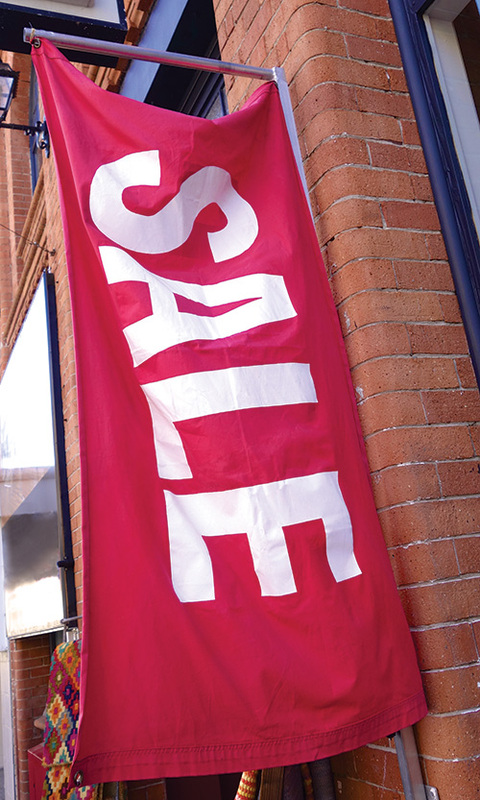 Outdoor flags and fabric banners have also become popular ways to attract consumer attention, while inviting more foot traffic into retail environments such as shopping centers, restaurants, car dealerships, gas stations and even doctors' offices. Flags and banners are relatively easy and inexpensive to create, allowing your customers flexibility with regard to updating and refreshing their messaging. Digitally printable textiles are also growing in popularity for banner stands and window graphics, where textiles can provide an aesthetically pleasing, soft look and feel. The growing appeal in soft signage, and the wide array of products you can print, can help open new markets of opportunities for printers. This includes printers who are who are still unsure of how to make it work within their operation, though many shops are looking for a way to take the next step in this direction. They want to grow their businesses, begin serving a more sophisticated clientele, and operate in markets generally dominated by high-volume print shops with multiple capabilities. The difficulty for many, however, is making the investment in new equipment before they have developed enough business to support a new technology purchase. An interesting market advantage with soft signage is that it can allow print shops to expand their product offerings quickly and begin printing for a much broader client base. Adding soft signage can also help a shop differentiate its offerings from the competition in a given market. Printers who don't find some way to be different, or who can't compete in trending markets, risk being left behind. Soft signage can help them make that difficult step up to the next level. As with any new world of opportunity, there are questions and concerns. But most of the ones tied to the soft signage category can be managed with the right guidance. For example, printers not active yet in soft signage may worry about durability. But those issues should be considered hurdles, not roadblocks. It's critical to understand how to select the right fabric for a specific application or desired result. Product durability is dependent on several factors, including ink construction, the coating, the base fabric, environmental conditions and physical conditions. For example, will it be touched by objects or people or washed? That's just a short list. Another fear people have in connection with printing soft signage is that anything with texture might be harder to print correctly, or that it will be less durable because of the texture involved. That is not necessarily the case. Though textured products are occasionally requested and may be prone to scratching, it isn't a given. Finishing methods can mitigate that issue, and the end use of the product will determine which finishing methods should be used to protect it. For example, someone printing fine art on a textured artist's canvas would almost always apply a liquid laminate or other optically clear sealant to protect the print. In addition, improvements in the coating chemistry can help increase the durability of the ink, and that's where research and development comes in. It's important to find business partners who can help you develop customized approaches and substrates. Soft signage is not static. As a medium, it's evolving quickly in multiple directions, and your customers are constantly looking for new types of textiles and fabrics. Industry partners who can help you customize your products or help develop finishes that enhance the end product can give you a competitive edge, as well as the tactical flexibility to adapt to the growing market. In order to be successful in this printing segment, you have to be an active player in its advancement. The alternative is to get left behind, so having knowledgeable industry partners can help you enter the soft signage market smoothly, successfully and lucratively. The bottom line? There are more reasons for stepping into this arena than for staying out. Printers who have been working with soft signage know that the processes involved are not that much different than traditional printing processes. There are challenges unique to the fabric world, but most are controllable or easily managed using the right equipment, ink and material suppliers. In other words, the fact that this is a new set of technologies does not have to be an obstacle to entering this vibrant market. As with any new endeavor, the key to success rests in finding the right partners. Stay tuned for Part 2 of this three-part series, where we'll look deeper into issues that can arise with soft signage printing and offer tips and guidelines for successful print management. Mark J. Shaneyfelt is a seasoned marketing and sales professional with extensive experiencing in development and commercialization of a full range of print media solutions for the expanding digital printing marketplace. Mark has been with the Aurora Specialty Textiles Group for the last year in the role of director of sales and marketing for Print Media. Previously, Mark lead successful print media product development and marketing efforts in partnership with Xerox and Hewlett Packard. Christian Smith is a wide-format print media sales account manager with Aurora Specialty Textiles Group. In this position he manages the wide- and grand-format print markets in the South Central US. Christian is factory-trained and certified on many of the industry's most popular wide-format printers and has extensive experience in technical sales and service. He is also an expert in the successful installation of wide format digital printing equipment, including HP, Mimaki, Reggiani Machine SPA and Seiko. At Next Wave Media Solutions, Smith worked globally with key accounts and helped customers redesign operations to increase productivity and maximize machine up-time. He holds a BS in Information Technology from Phoenix University.